Located in the Caribbean coast of Colombia, Cartagena can be best described as a hot city up to 40 degrees in January, an historical old town from the Hispanic time, private and public beaches, all kind of sea food and amazing people that will make your stay memorable. Rafael Nuñez International Airport has straight flights from Panama, United States and The Netherlands and receives more than 60 flights every day from Bogota. As well, you can arrive to the city in the different cruise lines that travel around the Caribbean. 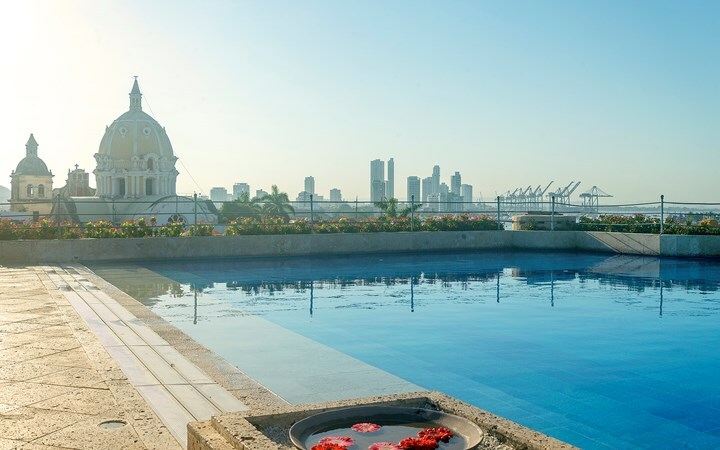 If you like the Spanish roots that the city has, you can find many different options in the old city like Sofitel Legend Santa Clata, Tcherassi Hotel + Spa and the Charleston Santa Teresa. Many hotels are located in old Spanish palaces or religious places that are mixed with the technology and commodities of our times. “Bocagrande” is the part of the city where most of the hotels are located, also call “The Miami of Colombia” because of the high buildings over there like Hyatt Regency Hotel or Estelar Hotel. As well, you can rent an apartment in some buildings like the Palmento Eliptic. In front of it, there are many public beaches where u can enjoy the sun and tropical weather. 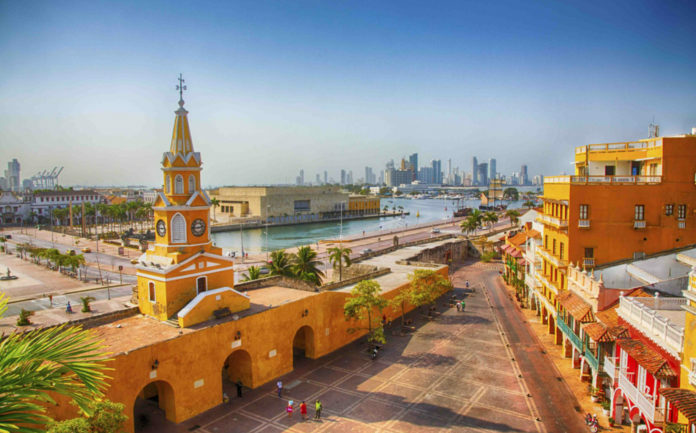 The main attraction about Cartagena it’s the amazing Old Town, with the old walls, build for protect the city from the pirates – Think Pirates of the Caribbean. Inside you can find colorful streets, the typical Hispanic summer houses with their balconies covered with all kind of flowers and churches in every corner. 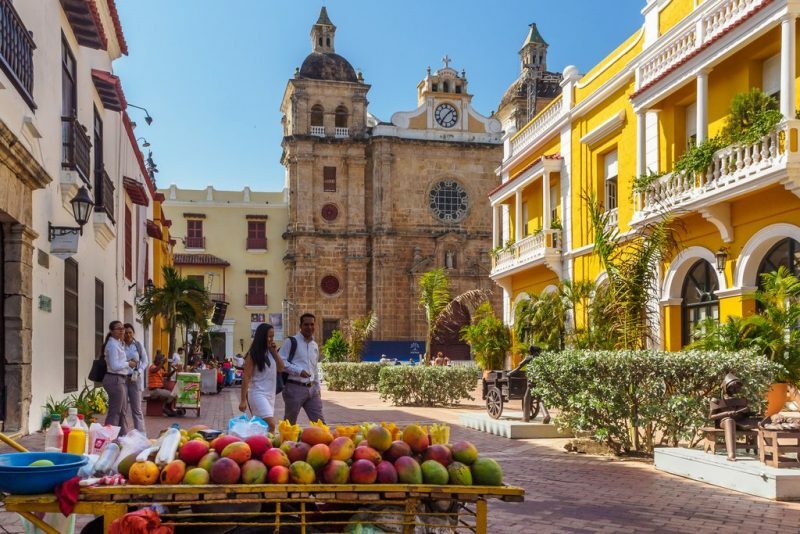 “La Torre del reloj”, a square where u find all the typical candies from the Caribbean region, as well as all the different kind of Colombian fruits. 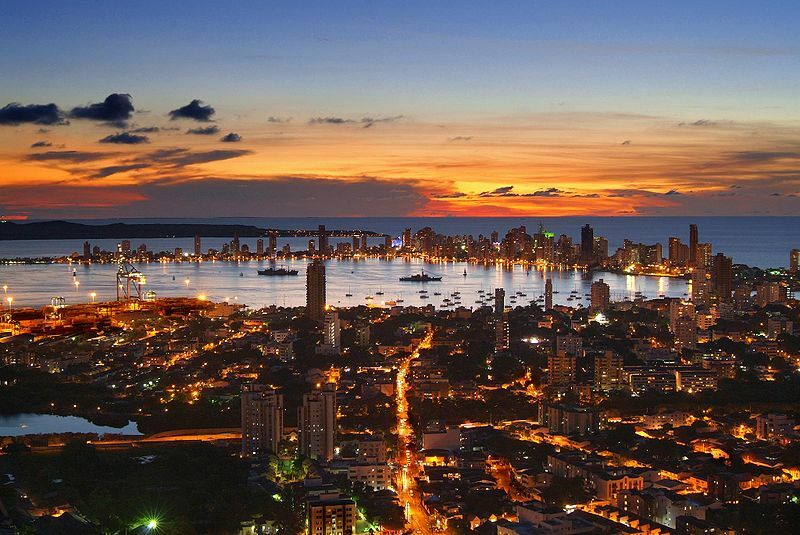 Cartagena was a jewel for the Spanish monarchy during the colonial times. That’s why they build a fortification to protect the old town and all the treasures on land and in the water. “El Castillo de San Felipe de Barajas” is where you can find the best view of the old town. At the end, you will spend most of the time chilling at the beach taking the sun and drinking a beer or eating shrimp. EVERYWHERE. The city has all kind of restaurants but go for seafood – the specialty of the city. “La Cocina de Pepina” where you can find one of the best shrimps with avocado or the typical rice with coconut in the city. Don’t be afraid and try some street-food, candies , fruits, shrimp, arepa de huevo and the typical dessert in the Caribbean call “Cocada”. “Las Bovedas” where you can find the best souvenirs in the city. You can find the typical Colombian bags or jewelry around the old town handmade by the natives. If you want some luxury shopping, you can find many stores with Colombian designer brands like Silvia Tcherassi or International like Michael Kors, Versace or Balenciaga. At night you can take a carriage and have a tour around the old town, where you can find many different bars and places where you can party in Colombian style. Previous Post Zagreb during Christmas!